What is inherited sensorineural deafness in dogs? Before discussing what inherited sensorineural deafness is we must first define the term deafness. Deafness is a term that is used to describe a loss of hearing. Deafness can be either a partial or complete absence of hearing that may affect one or both ears and it may be present since birth (congenital) or be acquired later in life. So what is the process involved in converting sound waves to something that a dog perceives? To understand the answer to this question, one must be familiar with the general anatomy of the hearing apparatus. 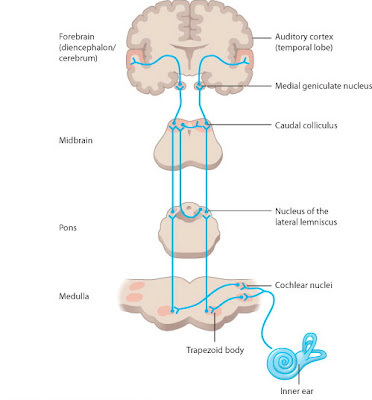 Generally speaking, the hearing apparatus can be described as being made of five components: the outer ear, middle ear, inner ear, auditory nerve, and brain (Figures 1 and 2). The outer ear is responsible for collecting and conducting sound waves to the middle ear. Sound waves cause vibration of a membrane that separates the outer and middle ears. This membrane is known commonly as the ear drum. Vibration of the ear drum results in vibration of tiny bones located in the middle ear. This mechanical vibration is further conducted to the inner ear where electrical impulses are generated. Inner ear electrical impulses travel to the brain via the auditory nerve. Finally, these electrical impulses travel to the brain where they are perceived as sound. By understanding the general hearing pathway, one can now more readily understand the general causes of deafness. Figure 1. 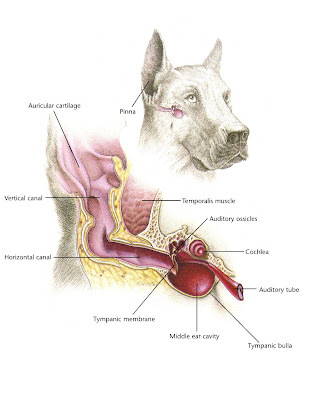 Illustration that highlights the normal ear anatomy of the dog. Reprinted with permission by Hill�s Pet Nutrition, Inc.
from the inner ear to the auditory portion of the cerebral cortex. The problem seen with inherited sensorineural deafness lies within the inner ear. 3) mixed deafness (sensorineural and conduction deafness). Pinschers. Coat colour-related sensorineural deafness is seen in a variety of breeds that are spotted, white patched, merle, or that have significant amount of white in their coat. The relationship between coat-colour and deafness is related to a failure of pigment cells migrating to the inner ear during development. These pigment cells are thought to be important for overall health of the inner ear. In their absence, the inner ear degenerates and the puppy is deaf. How is inherited sensorineural deafness related to coat colour inherited? Many people have been researching the mode of inheritance of inherited sensorineural deafness related to coat colour without success. Other research has identified a number of risk factors for developing deafness. For example, in Dalmatians, if a puppy is born with a pigmented patch it is less likely to be deaf than a puppy not born with a patch. Further for Dalmatians, or other breeds predisposed to developing coat colour-related sensorineural deafness, having blue eyes predisposes an individual to being deaf. We also know that having a dam or a sire that is deaf (whether only one ear or two ears affected) increases the likelihood of a litter having deafness. How is coat colour-related sensorineural deafness diagnosed? sensorineural deafness using brainstem auditory evoked response (BAER) testing. The coloured electrodes are placed beneath the skin and are used for recording the BAER. Sedation and anesthesia are not required to perform the BAER. The only definitive way of diagnosing coat colour-related sensorineural deafness is by measuring brainstem auditory evoked responses (i.e. BAER testing) (Figure 3). The test requires expensive and specialized equipment. Only highly skilled veterinarians with experience should perform the test (e.g. veterinary neurologists or veterinarians with advanced training in electrophysiological testing). The minimum age to perform the test is approximately 6 weeks. Animals being tested usually do not require sedation; appropriate restraint is usually sufficient for completing the test. The test consists of measuring the dog�s brainwaves during delivery of a �click� noise separately to each of the ears being tested. The waveforms that result are characteristic amongst all breeds of dogs (Figure 4). Animals that are deaf have a complete flat-line tracing. It should be noted, however, dogs with coat colour-related sensorineural deafness may be deaf in both ears or only in one ear. Figure 4. 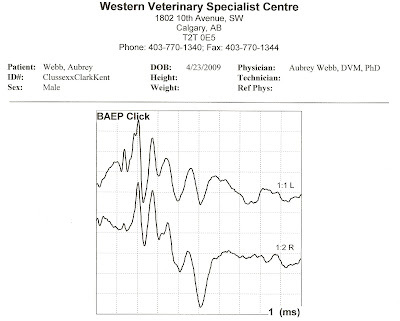 Brainstem auditory evoked response (BAER) tracing from the same dog in Fig 3. Note that the left (1:1L) and right (1:2R) have appropriate waveforms representing normal hearing. A dog with inherited deafness has an essentially flat-line tracing. My dog is affected with inherited sensorineural deafness, now what? Dogs that are deaf in only one ear adjust very well to their deafness. Owners of dogs that are deaf in one ear need to recognize that when speaking to the dog, they are hearing impaired, and as such common-sense things should be incorporated into training, including calling the dog from the side of the good ear, avoiding off-leash situations where an animal may travel distances that make hearing difficult, approaching the dog from the side of the non-deaf ear, etc. Dogs that are deaf in both ears pose a potential threat to people and other animals, and may place themselves in dangerous situations. Dogs that are deaf in both ears may startle easily and inadvertently bite a person (especially children) or other animals. As such, these dogs should be supervised continuously and unsuspecting people should be informed of the potential risk and approach the dog with caution. Animals with deafness in both ears should never be left off-leash (especially near roads and off-leash parks) unless in a confined and controlled environment (e.g. back yard). If not restrained appropriately, these dogs may bite other people or animals and may suffer the consequence of being struck by a moving vehicle. With regard to training, dogs that are deaf in both ears will require training via hand or other visual signals and/or vibrating collars. For more information regarding training and working with a deaf dog, it would be important to refer to your veterinarian, various books/articles, and trainers familiar with working with deaf dogs (see useful website links and reference material below). Finally, dogs diagnosed with inherited sensorineural deafness, should not be used for breeding, whether deaf in only one or both ears. As mentioned previously, for coat colour-related sensorineural deafness, it is known that dogs that are deaf in either one or two ears are more likely to produce deaf offspring compared to dogs that are not deaf. This is not to say that non-deaf dogs will not produce deaf puppies, however. I recommend that all puppies be tested in a litter, not just show-quality or those being kept for breeding or individuals suspected to be deaf. Given that inherited deafness related to coat colour is a multifactorial trait, a particular mating may result in a large proportion of puppies being affected. By testing an entire litter, future repeat matings may be averted. Why should we be concerned about inherited sensorineural deafness in the Clumber Spaniel? Although not formally reported, anecdotal reports of deaf Clumber spaniels are not unheard of (personal communications and www.clumbers.org ). Given the coat colour and coat colour pattern of the Clumber, it is reasonable to surmise that inherited coat colour-related sensorineural deafness exists in the breed. Considering that Clumber Spaniels are a relatively rare breed, and are derived from a small genetic pool, it is important to identify deaf individuals and remove them from the breeding population. Given the lack of genetic testing availability, and the multifactorial mode of inheritance of this condition, it is unlikely that inherited deafness could be eliminated from the breed using BAER testing alone, though reducing the incidence of deafness is indeed possible. It is this author�s opinion that it is important for the betterment of the breed, public relations for the breed, and overall genetic health of the breed that screening of Clumber Spaniels be performed using BAER testing. The Orthopedic Foundation for Animals (OFA-USA) already acts as a central repository and registry for any breed afflicted by inherited coat colour-related sensorineural deafness.